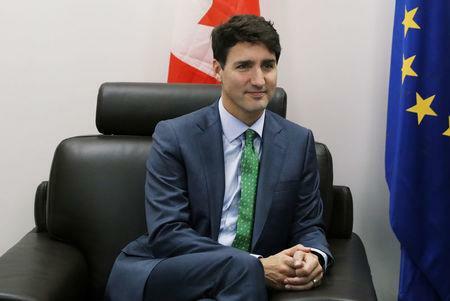 SINGAPORE (Reuters) - Canada and China will continue to work together towards an "eventual" free trade deal, Canadian Prime Minister Justin Trudeau said on Thursday. "This clause doesn’t prevent us from doing what we’re already doing which is indeed continuing to negotiate with China on an eventual free trade deal,” Trudeau said in a town hall with students at the National University of Singapore. The clause, which has stirred controversy in Canada, fits in with U.S. President Donald Trump’s efforts to isolate China economically and prevent Chinese companies from using Canada or Mexico as a "back door" to ship products tariff-free to the United States. "There is an element of transparency. We have to keep our partners informed on how we're doing," Trudeau added. “Yes, we talked about deepening trade ties, increasing flows of goods and services between Canada and China for the benefit of citizens and businesses on both sides," Trudeau said. "But I also talked about human rights, the situation of the Uighurs, we also talked about things that are difficult to talk about,” he added, without giving details. Trudeau's comments come just moments after Reuters reported that Canada is spearheading a group of 15 Western ambassadors in Beijing to seek a meeting with the top official in Xinjiang for an explanation of alleged rights abuses against ethnic Uighurs.